Your leather lounge is a big investment. It is an important piece of furniture in your living area and it’s important that you know how to care for it. Knowing how to clean your leather furniture properly will help extend its life and ensure that it remains looking good as new even after years of use. An important thing to consider in leather lounge cleaning is the type of leather upholstery. Different types of leather have different cleaning requirements. Check the label or any manual that came from the manufacturer to know which type of leather upholstery you have. Unfinished or aniline leather has a soft and luxurious feel but it has little to no protective coating. Its natural grains can be easily seen and it usually develops a patina. This type of leather is more sensitive to staining so you need to be very careful with it and clean it often. This is also called finished leather. It is more durable and stain-resistant and has a more uniform look than pure aniline leather. This leather also has a soft feel but is more durable than aniline because of its protective pigment. Some protected leathers may be coated with thick layers of pigment and polymer so you may notice that they feel stiffer and are not easily worn out. Here are some great tips to keep your leather lounge looking good as new. DIY cleaning solutions are great for many areas in your house but you may want to be more careful with using those in your leather lounge. They are not the best for cleaning leather upholstery. Some of these can even harm the leather. If your leather lounge has a warranty, beware that it can be void it gets damaged due to using the wrong cleaner or conditioner. Your leather lounge is prone to spills and stains especially if you invite guests over often or if you have kids. The best way to protect it is to apply some waterproofing treatment. Waterproof sprays and waxes provide a protective coating on your leather furniture to repel water. You only need to do this once a year so invest in a high quality waterproofing treatment. Waxes are more effective than sprays because they are more durable and are easier to apply. It is more difficult to be precise with sprays. Sometimes, the simplest solution makes the most sense. You only really need a damp cloth to clean your leather lounge’s surface. It is the most reliable method. The leather is already naturally durable so simply wiping it down without soap or chemicals once a week will work wonders. 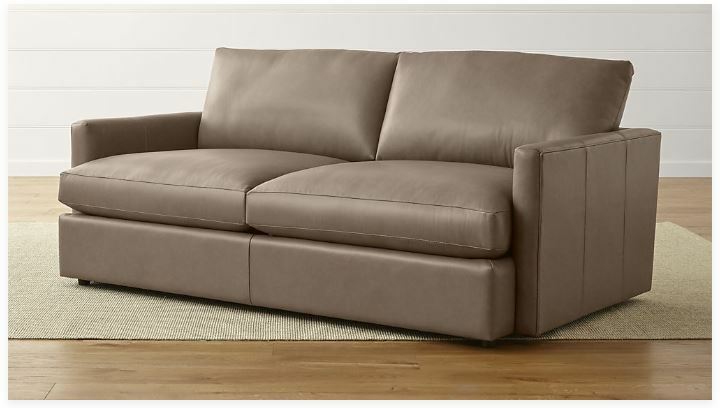 Wipe your leather lounge with a clean damp cloth to remove dirt and dust. This will make your lounge look good as new. If you will vacuum your leather lounge, make sure to use the upholstery attachment or brush attachment of the vacuum cleaner. Do not vacuum it directly with the main cleaner. This will make the dirt from the carpet stick to the furniture and will do more harm than good. Work your way from top to bottom when vacuuming then wipe it again after you vacuum. Leather upholstery is very sensitive to spills. If you don’t clean it immediately, the spill can soak into the leather and it will be difficult to remove the stain. Spills should be removed from the surface as soon as possible.